A Bank of Montreal poll found that 59 per cent of those surveyed did impulse shopping and bought items like clothes and shoes and also treated themselves to eating out. 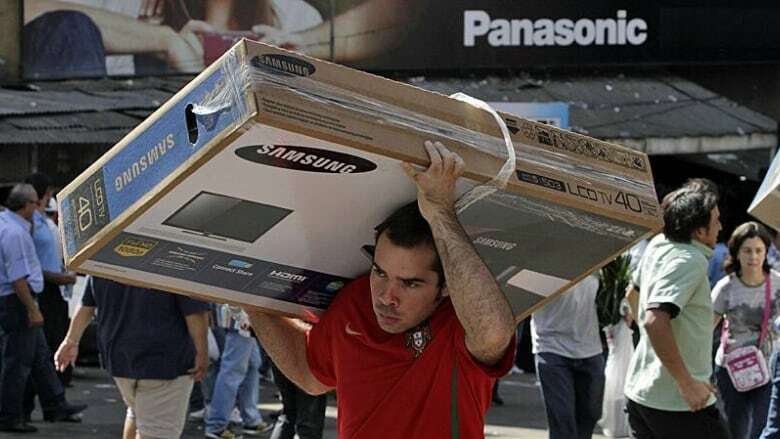 A man carries home his recent LCD television purchase. A BMO-sponsored poll released Tuesday shows men spend more on impulse buys than women do. A majority of Canadians surveyed by the Bank of Montreal say they shop to cheer themselves up and mood-lifting impulse purchases cost Canadians $3,720 annually. The Bank of Montreal poll found that 59 per cent of those surveyed did impulse shopping and bought items like clothes and shoes and also treated themselves to eating out. "We're really struggling to save money on a monthly basis," said Janet Peddigrew, district vice-president of midwestern Ontario at BMO. Consumers have been spending more than they've been saving over the last 10 years, which is cause for concern, Peddigrew said. "Those who answered the survey, the majority, said they would do it to cheer themselves up," she said. The survey found that 60 per cent of Canadians did this kind of emotional shopping and 55 per cent bought something they might not need because it was on sale. The poll results come as Canadian debt-to-income ratios sit at a record 152 per cent and top officials issue warnings to start paying down debt before interest rates rise. There's also an element of regret that comes with impulse shopping and in some cases, financial difficulties. The survey found that more than half of respondents regretted their purchases and 43 per cent sometimes spent more than they earned in a month. Another third of those surveyed had to borrow money or take out a loan to cover their impulse spending. The consequences of impulse spending were more common among Canadians under 30 with one in three unable to afford something they needed because of spending on "wants," the survey said. The online survey was conducted by Pollara and interviewed 1,000 adults between Aug. 31 and Sept. 5. The survey has a margin of error of plus or minus 3.1 per cent, 19 times out of 20.